Saul was breathing down the necks of the Master’s disciples, out for the kill. He went to the Chief Priest and got arrest warrants to take to the meeting places in Damascus so that if he found any of Jesus’ followers, he could arrest them and bring them to Jerusalem for punishment. He set off. When he got to the outskirts of Damascus, he was suddenly dazed by a blinding brilliant flash of light. As he fell to the ground, he heard a voice: “Saul, Saul, why are you out to get me?” Paul replied, “Who are you, Master?” “I am Jesus, the One you’re hunting down. I want you to get up and enter the city. In the city, you’ll be told what to do next.” replied the Voice. Saul’s companions stood there dumbstruck—they could hear the sound, but couldn’t see anyone—while Saul, picking himself up off the ground, found himself stone-blind. They had to take him by the hand and lead him into Damascus. He continued blind for three days. He ate nothing, drank nothing. So, we find Saul, blind as a bat, praying for all he’s worth, and a righteous man named Ananias being directed by a voice in two separate visions to go to a street in the city of Damascus called Straight Street. But, what is the significance of this street? And, how does one get there? Saul had no map. How was he, a blind man, to navigate his way to the appointed destination? Straight Street is the place where the Christian life becomes real, vibrant and alive. Straight Street is the place where “the rubber meets the road”, so to speak. It is the place where one discovers the abundant Christian life. Jesus says in Matthew, 7th chapter, verses 13-14, “Enter through the narrow gate. For wide is the gate and broad is the road that leads to destruction, and many enter through it. But small is the gate and narrow the road that leads to life, and only a few find it.” Straight Street is a narrow road! Only on Straight Street will one find meaning in this life. Only on Straight Street can one grow into new depths with God. As Saul traveled the road to Damascus, little did he know that he was on his life’s journey. He’d been a Pharisee, a respected man in the Jewish community, and an educated man but despite traveling in the broad daylight along the Damascus road, Saul was traveling in utter darkness. He thought he was doing well, but he was totally outside of a relationship with God. So, how did Saul get to Straight Street? The first step to Straight Street begins with Revelation. Revelation is when God interrupts your journey with light. It’s when God breaks into our darkness and helps us to see truth. Even though he was blinded, for the first time, Saul could now see himself for who he really was. He realized for the first time that he was outside of God’s will and purpose for his life. He had a revelation of his lostness and of who Jesus really is. One can’t get to Straight Street without first going down Revelation Road. On Humility Highway, Saul saw that education was meaningless. Family background was worthless. His accomplishments were fruitless. His religion and his zeal was empty. That is why Scripture says, “God opposes the proud but gives grace to the humble.” Saul needed God’s grace and the only way to received grace is through humility. Humility is the cloak of the true servant, to be used by God for God’s purpose. Saul had to walk in humility before God. Saul traveled down Revelation Road to Humility Highway and took another right on Surrender Street. Maybe you noticed that, so far, the trip has been nothing but right turns, but don’t worry, Saul’s not going in circles. In order to get to straight street, all of one’s turns must be right. In order to navigate Obedience Road, Saul had to walk in Blind obedience. Blind Obedience means obeying when we don’t know the outcome. It means obeying when we don’t understand why. Look at Ananais’ example! Lord called to him in a vision, “Ananias!” “Yes, Lord,” he answered. The Lord told him, “Go to the house of Judas on Straight Street and ask for a man from Tarsus named Saul, for he is praying. In a vision, he has seen a man named Ananias come and place his hands on him to restore his sight.” Away Ananias flew to do God’s will, no questions asked. Getting to Straight Street means: Blindly traveling Obedience Avenue; Absolute surrender to His will and purpose on Surrender Street; Leaving pride on Humility Road; Negotiating Revelation Road with eyes wide open to who Jesus really is and ridding ourselves of all selfishness. Sounds daunting, right? But God did not leave us without tools to assist us in the journey. He provided us all with, GPS (Go Pray Sincerely). If we use our GPS, God will bring us all individually to Straight Street. He will bring families to Straight Street. He will bring our churches to Straight Street. Prayer will give us access to Supernatural guidance! So, what happens when we get to Straight Street? Acts 9:12 says, “In a vision he has seen a man named Ananias come and place his hands on him to restore his sight.” It’s the place where we receive specific knowledge of God’s will for our lives. It’s where we will receive confidence in our calling. 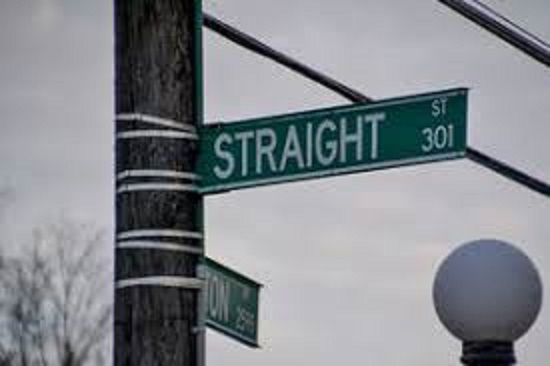 But, don’t make the mistake of thinking that Straight Street is Easy Street. If we want to get serious about our walk with God there will be suffering and sacrifice. It will cost something if we are going to make a difference in this world. But the reward outweighs any sacrifice and suffering. Acts 9:17-18 (NIV) say, “Then Ananias went to the house and entered it. Placing his hands on Saul, he said, ‘Brother Saul, the Lord—Jesus, who appeared to you on the road as you were coming here—has sent me so that you may see again and be filled with the Holy Spirit. Immediately, something like scales fell from Saul’s eyes, and he could see again. He got up and was baptized…” Saul’s healing came on Straight Street. His salvation came on Straight Street. Are YOU making all of the RIGHT turns to get to STRAIGHT STREET? God bless you. It’s an opener. It for sure ain’t easy but its the street we are heading for. With Him it is possible as are all things!